Because the characteristics of one shoreline to the next can have so much variance, a “one size fits all” approach to docks just doesn’t cut it. That’s why FLOE has developed three styles of dock systems to easily meet your needs. Never worry about replacing a dock again! FLOE docks are built to last. Engineered for stability and safety, FLOE sets the industry standard. Floe’s rust-resistant, flush mounted Easy-Level™ System allows top side leveling of the dock without ever entering the water! All that’s needed is a cordless drill or FLOE’s leveling tool. For a clean, smooth appearance, the adjustment hole is neatly topped off with a flat plastic cap. FLOE’S trademarked Quick-Connects and Easy-Level Wheel Kits allow for effortless connections and endless configurations! Because there is no hard bolting, dock sections can be simply moved or adjusted for needs and customization. FLOE’s most popular decking! Maintenance-free aluminum decking has a long-lasting, baked on, anti-skid surface. The light-grey hue and open, ribbed underside allows air to move freely and cool the dock surface. The aluminum also assists in keeping the deck cool by conducting and transferring the water temperature to the deck. Cutting edge paint application technology has allowed us to create a maintenance-free aluminum decking with the look of real wood. This patented powder coating process combines the aesthetics of real wood with all of the great features of our standard aluminum decking. Custom decking options are available for custom order installations or for larger residential and commercial applications. 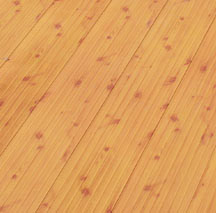 These include Carpet Dock Decking and Cedar Dock Decking options. The Bridge-Type Truss design of FLOE’s Roll-In docks provide the highest strength-to-weight ratio available. A clean, sharp appearance is achieved by welding the webbing to the inside of the dock. Waves flow through this open design rather than pound against it. Life at the lake just became that much better. Dock sections are available in 8′, 10′, 12′ and 16′ lengths and 2′, 4′, 6' and 8' widths. FLOE’s maintenance-free aluminum dock systems are manufactured to provide you with a long lasting, trouble-free investment. It may just be the last dock you ever buy! Imagine installing or removing a dock with just one person! Each section of the FLOE dock is equipped with high density polymer wheels so you lift less than half the weight of just one section no matter the length of the dock! Let the good times roll! FLOE Sectional Docks have a sturdy, lightweight design that allows for fast and easy assembly and breakdown with no tools required. They are engineered to allow for compact storage and exceptional value. They also feature the FLOE Easy-Level™ leg system with top-side leveling. Sectional docks are available in two styles: Standard and Quick-Attach™. Quick Attach™ lets you easily attach accessories anywhere along the dock side without drilling holes. These docks are solid to walk on and break down quickly with no tools. They are a great solution for shorelines with steep hills where traditional roll-in docks aren’t suitable and where there is limited shoreline space. The custom extruded frame gives high strength with low weight. FLOE uses corrosion-resistant stainless steel and aluminum fasteners. Dock sections are available in 4′ widths and 8′, 10′ or 12′ lengths. 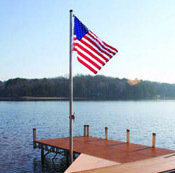 Floe’s rigid, heavy duty extruded aluminum frame is the backbone to the floating dock system. It provides a solid, stable base for the walking surface and is supported by foam filled, rotationally molded floats. The heavy duty outer frame also incorporates a patented track system which allows you to create custom configurations and add hinges, guide poles and other accessories anywhere along the dock side. An underside track system enables floats and anchoring systems to be attached. An aluminum guide-pole and bracket system to secure and stabilize dock sections in depths up to 10 feet. The auger end on the guide-poles twist into the lake bottom and is secured to the dock by a bracket that allows the dock to smoothly raise and lower with water fluctuations. FLOE’S floating dock sections include a quick release hinge that easily attaches dock sections together creating endless dock layouts. Simply float the dock sections into place, insert the pins in the hinge and install guide poles for easy installation.